Rabbi Mendel Gefner entering the Kosel plaza. Ever since our people were exiled from Eretz Yisrael, the thought of Yerushalayim has intensified in our collective heart. We mourned over it, dreamed about it, wrote poetry about it, and sometimes even strove to visit it, as Rabbeinu Yehudah HaLevi, the Ramban and Rabbeinu Ovadiah of Bartenura did, at considerable risk to their lives. Although these great men managed to reach the Holy City, they found no remnants of the Beis Hamikdash. The Kosel, the Western Wall of Har HaBayis, was nowhere to be found. Over the centuries of Roman, Byzantine and Moslem rule, the area known today as the Kosel Plaza was used as a dump, and the refuse was piled so high that the Kosel was completely invisible. Jewish visitors used to climb Har Hazeisim so they could view the site of Har HaBayis, and that was where they davened. This changed after the Ottoman Empire conquered Yerushalayim from the Christians. Under Christian rule, the Jews were persecuted mercilessly, making it next to impossible to establish any sort of community within the city. The Ottoman emperor Suleiman the Great, in contrast, respected Jews, and invited them to settle in Turkey and Eretz Yisrael. As part of his project to build a wall around Yerushalayim (the wall standing today that encloses the Old City), he told his people to clear out the dump from its eastern end. It was then that the Kosel was revealed and it became possible to approach it. Since that time the Kosel has been revered by Jews as the remnant of the Second Beis Hamikdash, from which the Shechinah has never left. For centuries, however, the area available for Jews to daven at the Kosel was quite limited. They were allowed an area only 28 meters (92 ft.) long and 3.6 meters (12 ft.) wide, without accommodation for protection from the sun or rain. On one of his visits to Eretz Yisrael, Sir Moshe Montifiore approached the Turkish authorities and asked for a roof to be constructed over a section of the narrow plaza. Though this request was approved, nothing was ever done about it. During Israel’s War of Independence in 1948, the Old City was captured by the Jordanian Legionnaires and all its Jews were exiled. For 19 long, painful years, Jews had no access to the Kosel until it was liberated in the most emotional moment of the Six Day War. 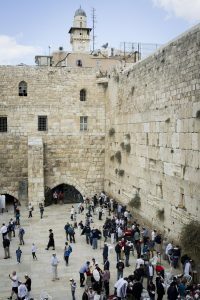 The Israeli authorities immediately evacuated the Arab squatters from the area adjacent to the Kosel and razed the structures in which they had lived, creating the wide plaza with which we are familiar today. 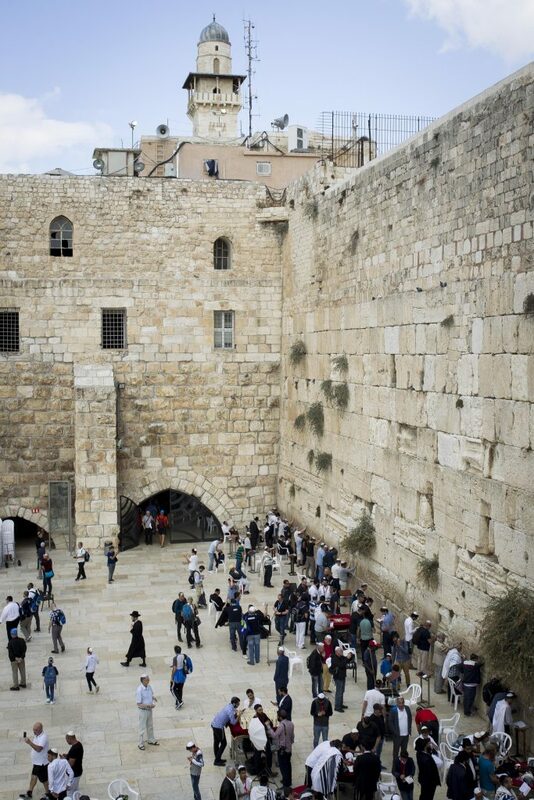 Jews from all over streamed to the Kosel to grace its aging stones. From that very day, Rabbi Menachem Mendel Reuven Gefner, zt”l, became a permanent fixture at the Kosel. He was attached to it with every fiber of his soul, and was there every day for the rest of his life, joining the Mishmar HaTehillim groups that he founded and led. 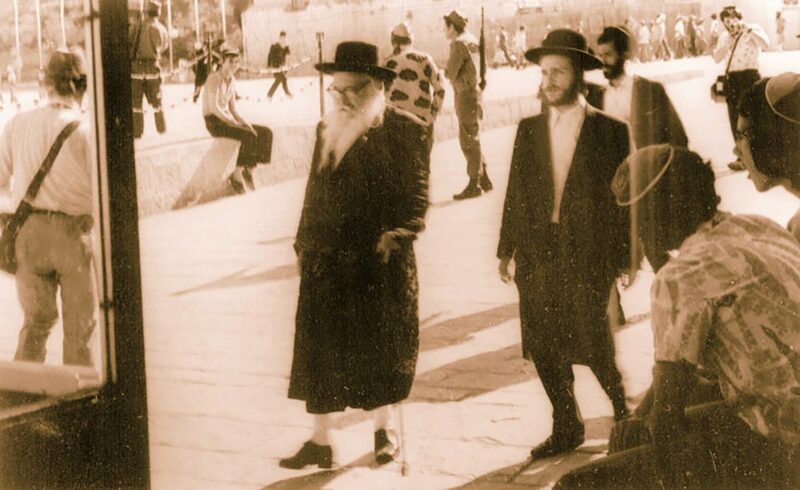 It is well known that Rabbi Gefner instituted the concept of holding a massive gathering for Birkas Kohanim at the Kosel, by hundreds of Kohanim, on one day of Chol Hamoed Pesach and Sukkos. We are taught that it is a tremendous zechus for the entire Klal Yisrael to be blessed by many Kohanim. Rabbi Gefner, imbued with an otherworldly love for the Kosel and a deep longing for the Shechinah, reestablished this practice shortly after the liberation of the Kosel in 1967. Already at that time many thousands of Jews congregated at the Kosel on Chol Hamoed to be blessed by hundreds of Kohanim — and it is practiced to this day. Attempting to encourage greater attendance at the Kosel, Reb Mendel posted this announcement in shuls throughout Yerushalayim: “Chazal teach that the Shechinah has never left the Kosel Hamaaravi, and that it is vital to greet the Shechinah at least once a month. Imagine the enormous merit of people who visit the Shechinah on a weekly basis. If someone does so daily, he is a fortunate Jew indeed. Reb Mendel became an inseparable feature of the Kosel Plaza, where he could be seen each day seated inches away from its stones, holding a Tehillim. His voice could be heard across the plaza’s expanse, and it seemed his entreaties rose through all seven levels of Heaven. When he reached the pesukim (Tehillim 102:14, 15) “You will rise and have mercy on Zion, for it is the time to grace it — the appointed time has arrived. Your worshipers desire its stones and favored its soil,” he would invariably jump up from his seat and spread his hands on the wall and begin weeping, repeating those words again and again through his tears. Once he completed Tehillim, Reb Mendel would read the prescribed tefillah out loud, sobbing incessantly. The people around him would ask him to daven specifically for their relatives and acquaintances who were ill, and he good-naturedly repeated every name, groaning and sighing in empathy for their suffering. It never happened that he did not have the patience to daven for each individual, beginning with the names of elderly Rabbanim and Gedolei Hador, even for those in perfect health. He explained that a prayer to maintain one’s good health is far more likely to be accepted than a prayer to restore the health of someone who is ill, citing Chazal (Shabbos 32a). Each month, on the afternoon before Rosh Chodesh, Reb Mendel would recite Hataras Kelalos, following the version recommended by Harav Chaim Palachi. Once he and his group had completed Tehillim, he led them through the passage leading to the spot assumed to be directly across from the Kodesh HaKodashim, and there he recited the hatarah. Many later claimed that their problems or suffering were relieved miraculously soon after participating in this hatarah. Once, after spending a lengthy period in the hospital, he was released to go home. Reb Mendel insisted, however, that he be taken to the Kosel first. “That is my home,” he explained. “It is the embodiment of Im bechukosai teileichu, for teileichu has the same Hebrew letters as kosel.” Once he arrived, he held onto the aging stones and wept like a child meeting his father after a lengthy absence. The family explained that his grave condition did not permit such an excursion, and that a doctor was arriving momentarily. Reb Mendel scoffed, saying, “The doctor forgot, and he will be late,” and began preparing himself for the trip. With superhuman effort, he arrived at the Kosel and lit the menorah. With flowing tears, he sang the traditional songs, kissed the Kosel’s stones, and returned home. Shortly afterward, the doctor arrived and apologized for being late. Soon after the Kosel’s liberation, the initial excitement over it waned. At that time, the roads were not properly paved and public transportation to the Old City was nonexistent. Anyone who wished to visit the Kosel had to walk a considerable distance. Furthermore, there were no amenities yet at the Kosel Plaza to accommodate its visitors, nor was it possible to daven at the Kosel indoors. As a result, very few courageous and determined individuals continued to visit on a regular basis. Crowds arrived only on Yom Tov or special occasions. The secular government at that time (yes, it is not only happening today) wished to convert the Kosel Plaza into a tourist attraction rather than consecrate it as a place for davening used mainly by the chareidi population. They were resistant to the idea of erecting a mechitzah to divide the plaza into separate sections for men and women. In the end they agreed, stipulating the mechitzah could be only as high as it is at present. The plaza remained unpaved, with the remains of the Arab homes strewn across its expanse. The Kosel’s visitors had to weave their way through the plaza, and they became covered with dust each time. In the meantime Reb Mendel was busy doing his part. He had previously established three different Tehillim groups in the shteiblach of Me’ah Shearim, and now he wished to relocate them to the Kosel, where he was sure the prayers would be far more effective. He approached the government committee in charge of the development of the Kosel Plaza, and spoke to them forcefully but respectfully: “I have come today to beg you to have mercy on the Kosel Hamaaravi, and save it from the disgrace that has been heaped upon it for so many centuries. Reb Mendel explained how, in the time of the Second Beis Hamikdash, Har HaBayis was shaded by a roof to protect visitors from the sun and rain. It was only because of the Muslims’ hatred of the Jews that no such accommodations were permitted in previous centuries. Now that we had the authority and power, it behooved the government to use this opportunity to correct this long-standing blemish, he argued. Reb Mendel brought the three mishmaros of Tehillim to the Kosel long before there were proper accommodations, hoping to showcase the need for improvements at the site. The participants were forced to stand, leaning on their canes the entire time, for there were no seats. Neither restrooms nor water for hand-washing were available close by. When this was brought to the attention of a high government official, he promised to remedy the situation. Dozens of chairs suddenly appeared, the plaza was cleared and paved, water fountains were installed, and restrooms constructed.